Most scientists can see, hear, smell, touch or even taste their research. But astronomers can only study light — photons traveling billions of light-years across the cosmos before getting scooped up by an array of radio dishes or a single parabolic mirror orbiting the Earth. Luckily the universe is overflowing with photons across a spectrum of energies and wavelengths. But astronomers don’t fully understand where most of the light, especially in the early universe, originates. Now, new simulations hope to uncover the origin of the ultraviolet light that bathes — and shapes — the early cosmos. Answering this question will give us a valuable insight into the way the universe built its galaxies over time. It will also help astronomers calibrate their measurements of dark energy, the mysterious agent that is somehow accelerating the universe’s expansion. The problem is that most of intergalactic space is impossible to see directly. But quasars — brilliant galactic centers fueled by black holes rapidly accreting material — shine brightly and illuminate otherwise invisible matter. Any intervening gas will absorb the quasar’s light and leave dark lines in the arriving spectrum. “Because they can be seen at such great distances, quasars are a useful probe for finding out the properties of the universe,” said Pontzen. “Distant quasars can be used as a backlight, and the properties of the gas between them and us are imprinted on the light. Multiple clouds of intervening hydrogen gas leave a “forest” of hydrogen absorption lines in the quasar’s spectrum. 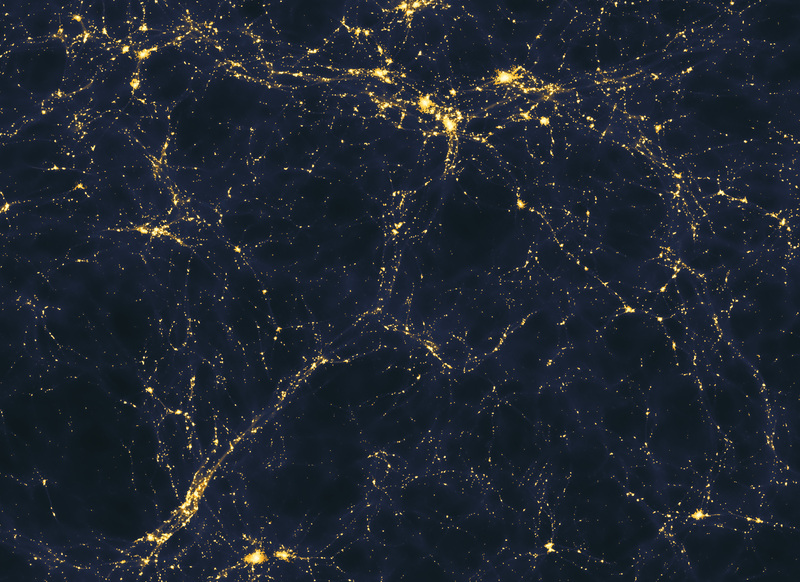 But, crucially, not all gas in the universe contributes to these dark lines. When hydrogen is bombarded by ultraviolet light, it becomes ionized — the electron separates from the proton — which renders it transparent. So the pattern of absorption lines visible in a quasar’s spectrum map out the location of neutral and ionized regions in between the quasar and the Earth. This pattern will tell astronomers the main contributing light source in the early universe. Quasars are fairly limited in number but individually extremely bright. If they caused most of the radiation, the pattern will be far from uniform, with some areas nearly transparent and others strongly opaque. But if galaxies, which are far more numerous but much dimmer, caused most of the radiation, the pattern will be very uniform, with evenly spaced absorption lines. Current samples of quasars aren’t quite big enough for a robust analysis of the subtle differences between the two scenarios. But Pontzen and colleagues show that a number of new surveys should shed light on the question. The team is hopeful the DESI (Dark Energy Spectroscopic Instrument) survey, which will look at about a million distant quasars in order to better understand dark energy, will also show the distribution of intervening gas. The paper was published Aug. 27 in the Astrophysical Journal Letters and is available online.